Sounds from a shallow eutrophic pond, part of the Ecology Park in the grounds of the Museum. Ecology Park is an observation field, located right adjacent to the main building. Within approximately 6.6 ha (16.3 acres) of the grounds, natural woodlands are preserved around Funada-ike Pond. Different types of forest and grassland vegetation found on the Boso Peninsula have been reconstructed starting from bare earth. In the park, you can have a close look at the life of plants and animals and their seasonal changes. Sounds of birds including Little Grebe, insects, traffic, amphibians, notably the invasive American Bullfrog Rana catesbeiana, introduced as a food species in 1918. 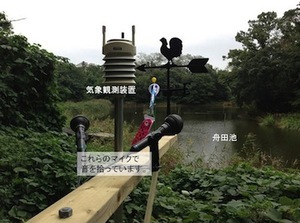 One of several monitoring points with live audio, meteorological data and time lapse images, maintained by the University of Tokyo under the Cyberforest programme.